Unlike video-voice technology, which anyone can benefit greatly from, thermal video provides more value to some businesses than others. At Viewpoint, when discussing this with a client, we consider all aspects of the client’s business, including the security objective (to deter or to apprehend), the monitored site’s location and which tools or analytics the client plans to pair the cameras with. In thermal video, you can’t see facial or clothing details, but you can see how many people there are; their basic motion and direction of travel; and whether they’re squatting, lying down, etc., all with a level of detail that depends upon how far away the thermal camera is from the intruders. 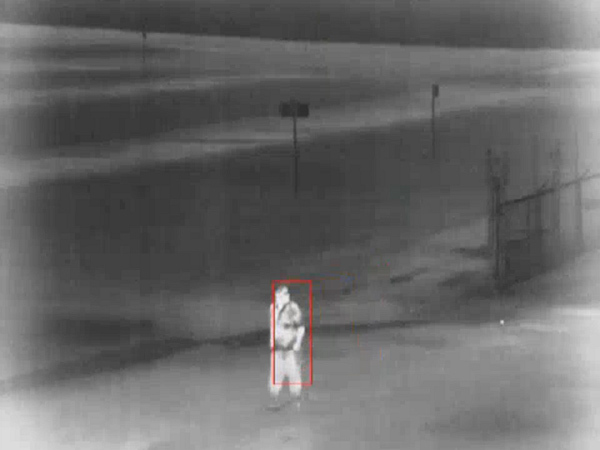 Video analytics can generate an alert any time a person enters the detection zone, prompting an alarm response from a monitoring command center. These systems, which can be used with thermal or regular cameras, run complex algorithms that detect contrasts among pixels that form a human shape. Because a thermal image of a human body typically contrasts so much more with its environment than a CCTV image does, analytic systems can more reliably identify any heat-producing shapes in thermal images. There are a few exceptions; for example, if the ground is releasing all the heat it absorbed on a really warm day, the contrast can be less stark, and your analytics from a regular camera might be more accurate. Every site has an actual perimeter or fence line, as well as a “perimeter outside the perimeter,” or what we call a virtual fence line. This is the area where people wouldn’t be considered trespassing, but their presence would be suspicious. At Viewpoint, many sites we monitor and protect use this virtual fence line strategy. In the case of a more isolated property, there’s no legitimate reason why a person would come anywhere near it. There’s not a park nearby, there’s not a walking trail, there’s nothing but the site. At a lot of these facilities, we shouldn’t see people at all — so if we do, it’s a problem. Thermal video is the quickest way to spot that problem and stop it in its tracks. When you have an expansive perimeter, you won’t always have power every 50 feet for a CCTV system to fully cover the area with cameras. Instead, it often makes sense to use a mix of wide-ranging thermals and strategically placed traditional units. The thermals pick up activity that can be further examined on regular cameras or addressed with a video-voice intervention. Fog, rain and snow can greatly affect a normal camera’s range of vision. Conversely, a thermal camera will produce an even clearer image of a person hundreds of yards away on a cold, snowy day than it will on a hot, sunny one, because the contrast is greater. When combined with video-voice technology, thermal imaging allows you to detect and discourage criminal activity at the earliest possible stage. Using the “perimeter outside the perimeter” strategy noted above, any potential intruders will trigger alarms before they even get close to the property. Agents can respond with an authoritative voicedown (video-voice response), announcing to those in the area that the property is monitored and that their actions are being recorded. Since criminals all have one thing in common — none of them wants to get caught — as soon as they know they’re being watched, they’ll usually leave the scene. Thermal camera systems are only truly effective if they’re part of a blended solution — that is, if highly trained and capable agents are monitoring them. They do not capture details, such as faces and license plate numbers, that can be used forensically to catch criminals after the fact. In short, it makes no sense to use thermal cameras unless they’re being monitored. When they are, they provide a very powerful tool for security professionals. Early detection is the key, and a monitored thermal CCTV system is unmatched in that area.